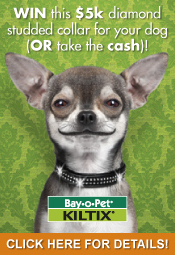 Win your pet a $5000 diamond collar (or keep the cash) by purchasing a Kiltix Collar from www.vetshopaustralia.com.au. To win this dream collar simply make your purchase, have your barcode details handy and visit the Kiltix site to participate in a fun interactive game before registering your details. By purchasing the Kiltix Collar you will not only be in the running to win, you will also be helping to protect your pet as we enter the dreaded tick season! The Collar will kill and repel ticks, provide 6 weeks protection against paralysis ticks and control brown dog and bush ticks for up to 5 months. Purchase your Kiltix Tick Collar now. For full promotion details visit our Kiltix Collar promotion page.